It’s December. Snow has fallen. It’s winter for all practical purposes. There is a no need to be a couch potato this time of year staying cozy by the fire for hours or binge watching a preferred TV show. Not when there are fun things to do outside, that is! 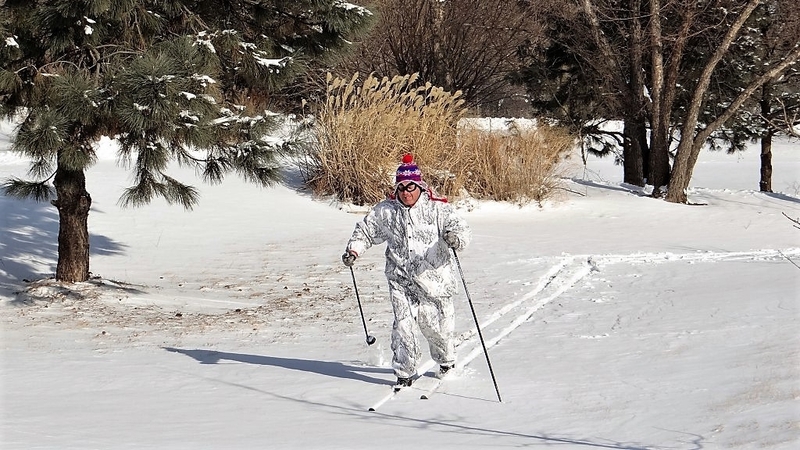 Your blogger enjoys a cross-country skiing trek on public property in southeast Omaha, NE. Photo by Katie Stacey/Nebraska Game and Parks Commission. When the snow flies and blankets the ground, the race begins for cross-country skiers and snowshoers to make the most of their time on the white stuff. 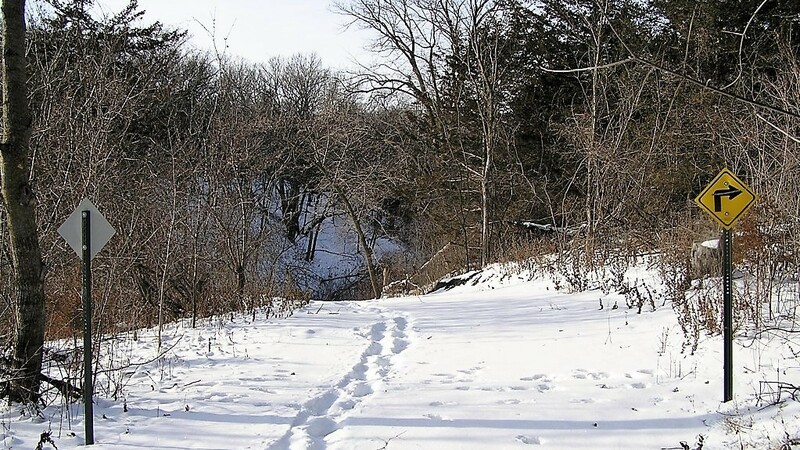 In fact, a number of these winter outdoor enthusiasts fully experience nature by taking to the snow covered trails in the Nebraska state park system. If excellent aerobic winter workouts and opportunities to get Vitamin D are sought, cross-country skiing and snowshoeing would be perfect fits. Trail for cross-country skiing at Lewis and Clark Lake State Recreation Area near Crofton, NE. Photo courtesy of Parks Division/Nebraska Game and Parks Commission. Whether watching from the warmth of the living room or traipsing through the woods of a state park area, winter is a wonderful time to observe birds. It is easy to entice new feathered visitors to your yard in winter by offering much-appreciated food, water and shelter. Or grab your boots and parka and make a visit to their haunts in a nearby park or green space. As part of the Winterfest celebration in the Nebraska state park lands, there are an array of guided bird watching activities scheduled that are open to beginning birders and experienced ornithologists alike. Whatever the preference is, there are many different bird species to be seen. 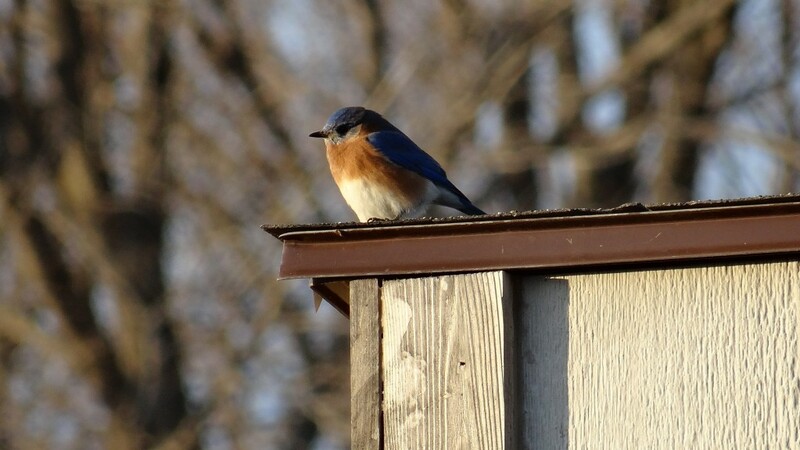 An eastern bluebird in winter perched on the edge of a shed at your blogger’s backyard in Omaha’s Metcalfe Park neighborhood. Photo by Greg Wagner/Nebraska Game and Parks Commission. Most folks think when the cold weather comes, the hiking season is over, but that is definitely not the case! The grounds to Nebraska’s 77 state park areas are open for recreational use and have dozens of miles of hiking trails available. The nice thing is the these trails are not crowded in the winter. Due to the tranquility, the chances of seeing a variety of wildlife creatures are good. Additionally, with snow cover and some ice, there are beautiful views to be relished, fantastic landscape photos to be taken and unique images to be captured. 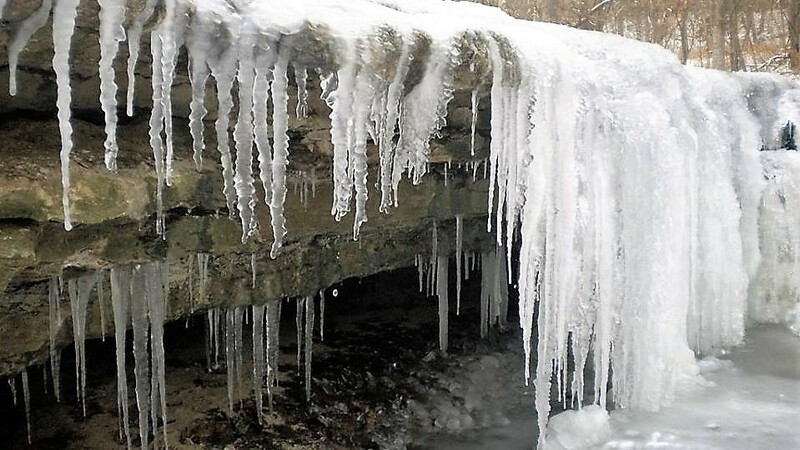 Frozen waterfall along the Stone Creek Hiking Trail at Platte River State Park near Louisville, NE. Photo courtesy of Parks Division/Nebraska Game and Parks Commission. There is really no better way to enjoy magic of winter than by zooming down a snow-packed hill on a plastic sled, toboggan, saucer or inner tube. 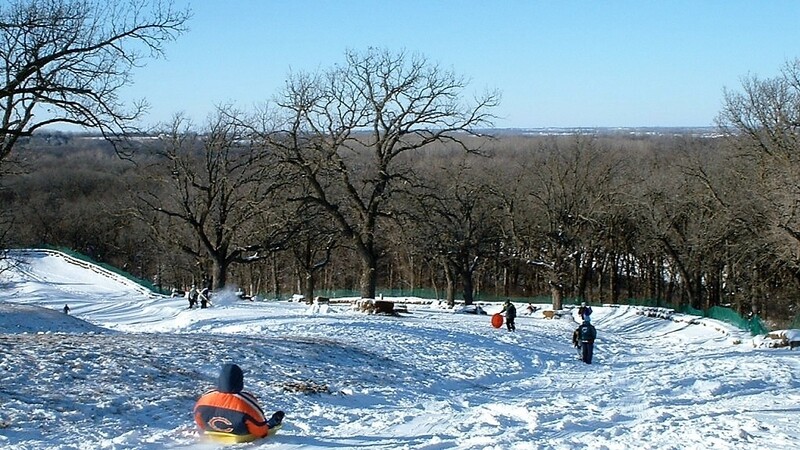 Sure, the neighborhood or town hill where everyone goes is fun, but for the ultimate in sledding and tobogganing, Mahoney State Park near Ashland, NE is truly the place to be! The park has three specially-designed, hilly runs to zing down; one of them is about half the length of the others so it’s ideal for the smaller kids. The main sledding/tobogganing run at Mahoney State Park near Ashland, NE. Photo courtesy of NEBRASKAland Magazine/Nebraska Game and Parks Commission. Have snow cover? Then, perhaps a game of snow soccer or snow touch football is in order. Falling in the snow during those contests is no big deal. In fact, it is part of the fun! The snow is there for a cushion. To establish a snow soccer or touch football field, simply round up four bright, colorful, old shirts. Set them on the ground to mark the goal lines. Go get the ball, it’s game time! 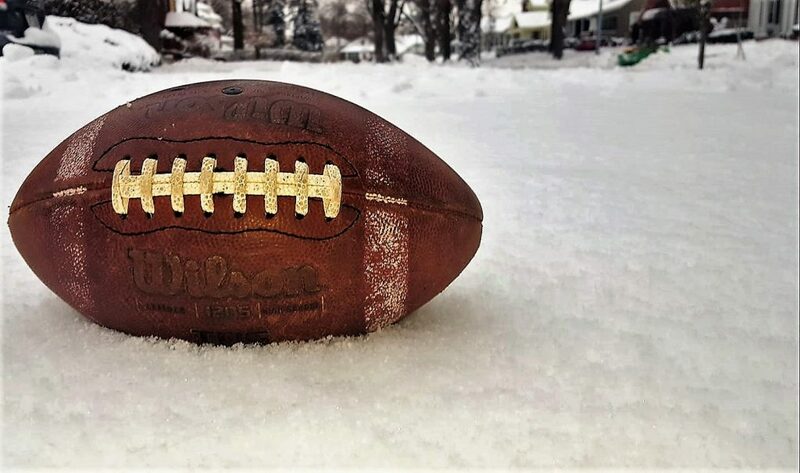 A football lies in the snow cover of your blogger’s front yard in Omaha’s Metcalfe Park Neighborhood. Photo by Greg Wagner/Nebraska Game and Parks Commission. A favorite winter past time for scores of parents and children alike is ice skating. It is a great way to stay active during the cold winter months. The learning curve for ice skating is not steep, and newcomers do well after a short while. When deciding where to ice skate this winter, there are plenty of options including both local indoor and outdoor ice skating rinks. 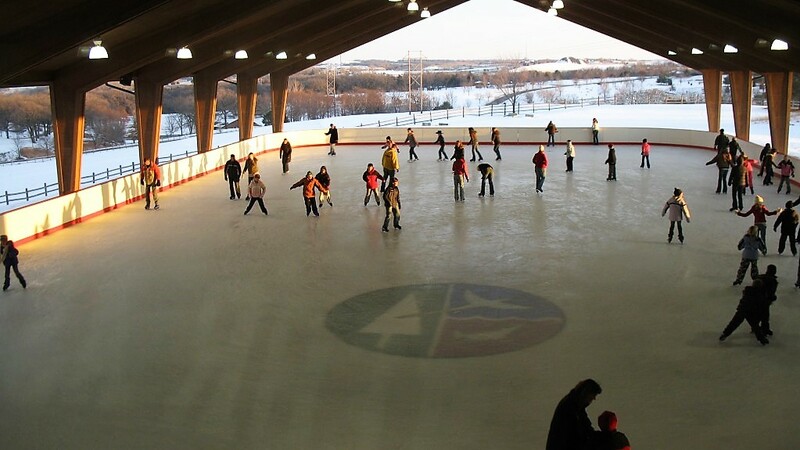 In eastern Nebraska, a popular ice skating option is located at Mahoney State Park. The park has a large, covered, open-air ice skating rink where ice skates can be rented. The ice skating rink at Mahoney State Park near Ashland, NE. Photo courtesy of NEBRASKAland Magazine/Nebraska Game and Parks Commission. 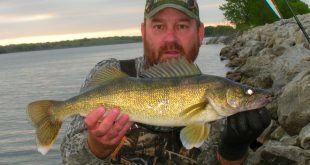 If you love the great outdoors, the snow, the crisp, clean air and fresh fish from the frig — the lifestyle of ice fishing may very well surprise you with one of the best days you’ve had all winter. And, if done properly, it can be one of the most adventurous outdoor excursions ever on a densely frozen water body not far from home! Manufacturers and retailers in the ice fishing equipment industry are luring an increasing amount of new ice anglers to the lifestyle with products that put more even emphasis safety, comfort, technology and mobility. 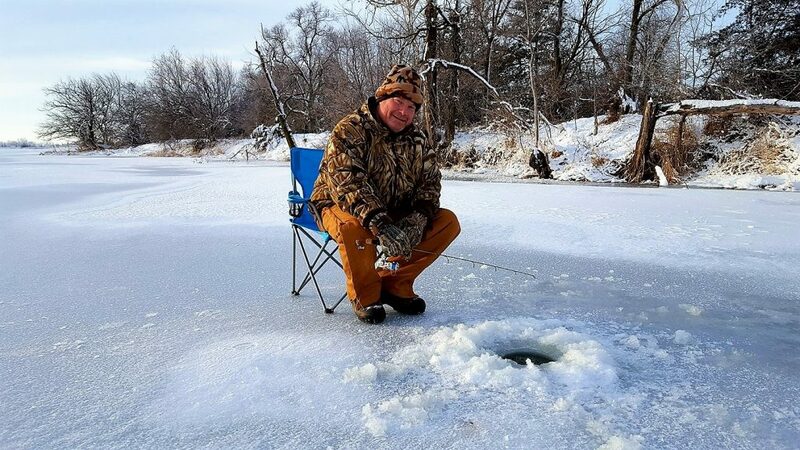 The Nebraska Game and Parks Commission offers ice fishing clinics each January to teach novice ice anglers important safety precautions and basic skills. Your blogger is ice fishing at a private lake near Omaha, NE. Photo by Rich Berggren/Nebraska Game and Parks Commission. Hunting gear should not be put away for the winter period!. Hunters should bundle up and take advantage of low hunting pressure, colder weather, a completed crop harvest, concentrated and more predictable game, plus more receptive landowners to hunting access. The word ‘late’ in the late season for hunting is a misnomer. Truth is, late season hunting is challenging but very rewarding whether it is for pheasant, quail, deer, turkey or other game species. 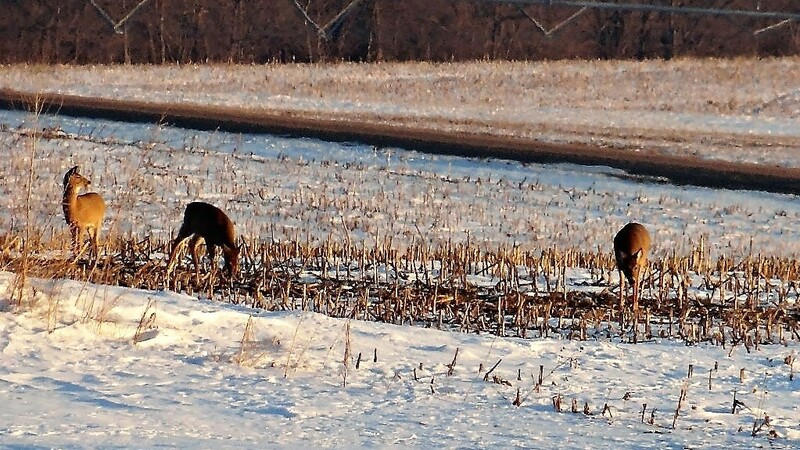 Deer browse in a harvested cornfield in Saunders County, NE during Nebraska’s December muzzleloader deer hunting season. Photo by Greg Wagner/Nebraska Game and Parks Commission. Next Ice Safety Reminder, Again!